How many of us grew up eating grilled cheese sandwiches? As a kid, it was my favorite food for hot lunch. Even now, I still get weak in the knees for grilled cheese. And my husband, Colin, asks if we can have it for dinner at least once a week. As for Colin, he was impressed with the amazing combination of flavors. He took one bite and said, “This is NOT your ordinary grilled cheese.” And it’s super filling too. This recipe is a favorite at our house. 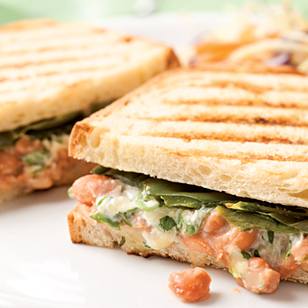 Lots of colorful vegetables and salsa make this cheesy panini prettier than any grilled cheese you've ever seen. The small amount of Cheddar cheese in this sandwich goes a long way because it is shredded and sharp. Serve with a mixed salad and you've got a delightful lunch or light supper. A creamy spread full of Parmesan and fresh basil cozies up to turkey and tomato slices for a savory hot sandwich that will quickly become a go-to mealtime solution. For a great grilled sandwich filling, spike canned tuna with salty olives and capers, bright lemon juice and tangy feta. Yum! OK, so this recipe isn’t your typical grilled cheese sandwich. But it’s perfect for warmer weather, because you make it on the grill instead of in a pan. Plus it’s so cheesy and creamy and delicious—it will satisfy all of your grilled cheese cravings.